Sunflower's Story . . .
Yeah for gaining to a healthy weight! Yeah for bravery when visiting the vet and groomer! Yeah for a growing understanding that her foster mom is trustworthy! For many dogs such realities come together over a few weeks in foster care. For Sunflower, aka Sunny, these essentials are coming together slowly but they’re coming. “Sunny’s making slow but steady progress in dealing with her fear of people. She is almost always within 5 feet of me and will stay that close as long as no one tries to pet her. Sunny has not gotten to the point yet that she enjoys being petted, but she’s moving in the right direction.” Patience is paying off. Know that many are rooting for you from afar, Sunny! Fingers crossed that your next news will be equally as good and, in the meantime, maybe you’d send a picture of that new do?? Update 03/23/2015: “With loving care and nurturing, she’s setting the pace." “All in its own time…” speaks to the wisdom of patience. Often, that’s a huge part of what a foster dog needs and what foster families provide, that and a lot of love to bridge the gap between a previous life and the one awaiting. For Miss Sunflower, patience and time are serving her well. She has everything she needs to move toward her goal. With loving care and nurturing, she’s setting the pace. All will come together for her in her own time. Until then, know she’s in good hands and is lucky to have found MAESSR…. Update 09/11/2014: “Trail walking through the mountains is one of Sunflower's favorite things to do, but she enjoys miles of walking even when it's not as adventurous as the mountain trails." Like the flower for which she is named, lovely Sunflower is beginning to turn her face to the sun and enjoy the world around her. Sunflower is still a shy girl who will need someone who can continue to bring her out of her shell. This beauty continues to be very leery of strangers and things out of her norm, but she is working very hard to accept changes more quickly and with ease. The more exposure she has to new things, the more self-assured she is becoming. She loves to sleep in the bed with her foster mom and tries very hard to be less scared. a little investigative sniff to decipher what in the world he was. 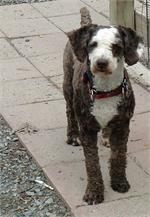 Sunflower is completely crate trained and will only have a rare accident in the home when she is feeling completely insecure. She will cuddle up with her foster family when asked. This Spanish Princess likes to be loved on, takes a bath like a nice girl, and loves car rides (even though they make her a little nervous at first). Trail walking through the mountains is one of Sunflower’s favorite things to do, but she enjoys miles of walking even when it's not as adventurous as the mountain trails. She likes to keep moving forward and explore the outdoors with her foster mom. Guidance is the key to bringing Sunflower out of her "happy" place, a spot on the couch where she is “invisible.” Sunflower has had so many adjustments in her short life and is just taking a while to adjust to those huge 2-legged critters so much taller than she. She has come a long way and is now learning that the world is a wonderful place. What a beautiful girl and happy pup she’ll be when she is ready for her forever home. Update 07/14/2014: “This fluffy cutie continues to walk well on a leash and enjoy her time outdoors......summertime, summertime!!" 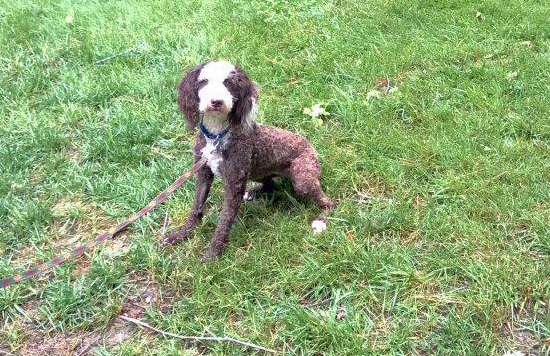 Sunflower, a Spanish Water Dog, who, for the moment, is a Springer wanna-be, is growing with the summer season. While she hasn’t gained any weight, she is a very good eater and cleans her bowl every time. She is also blossoming in her trust of people. She is more comfortable with her foster home and is adjusting to her routine. At times, she will come to her foster family if they sit on the floor and call her. She likes her people to be at her level. Sunflower has not yet been exposed to children other than her foster 12 year old, but she reacts no differently than to adults. This fluffy cutie continues to walk well on a leash and enjoy her time outdoors......summertime, summertime!! 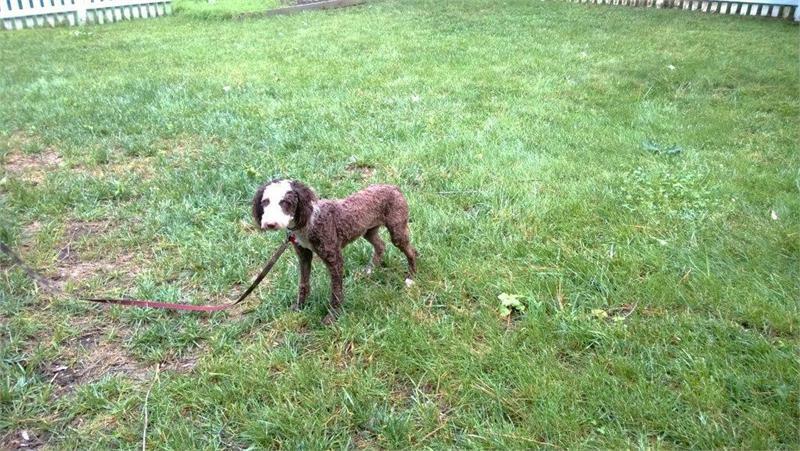 Housetraining is a work in progress, and she is taken outside on her leash on a very regular basis. Sunflower is still very timid and will need a patient family who will help her learn to trust animals of the human variety, to run and play and be the very best pup that she can be. Original: “Sunflower is beginning to come out of her shell and becoming comfortable with her foster family." Sunflower came from a kennel in Maryland that was closing. 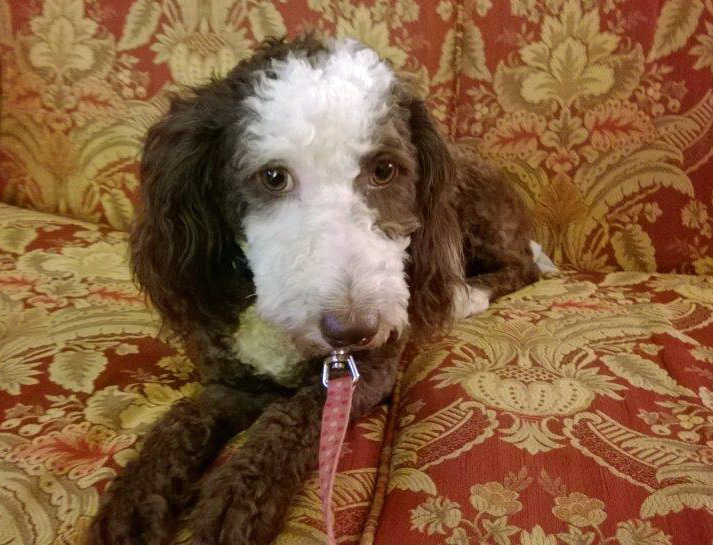 MAESSR was able to help with the placement of the dogs so Sunflower, a Spanish Water Dog, has become a MAESSR girl. This shy little girl is being exposed to many new experiences ― first and foremost being learning to live with a family in a home environment. Shy towards humans, she is in the process of learning that people can be trusted. She seems to be more comfortable with human attention when her people get down on her level on the floor. She has not learned about toys yet, but that may change as she learns to interact with her humans. Every day Sunflower comes out of her shell more, becoming more comfortable with her foster family and growing in curiosity about her new life. Easy to have around, Sunflower is quiet and tries to be invisible. She has nice house manners and does not counter-surf or get onto the furniture. 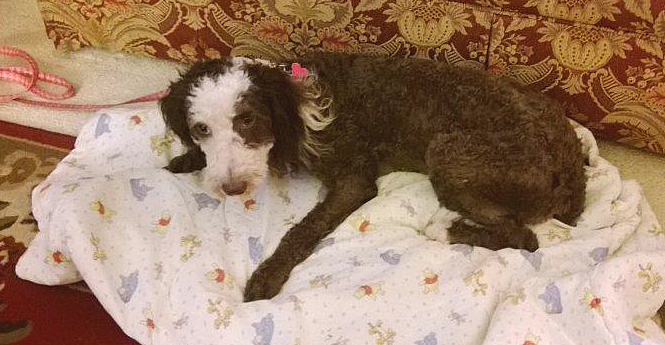 She is not housetrained yet so her foster family takes her outside frequently to eliminate. Sunflower takes to her crate easily and she is crated when her foster family is out of the house, at night, and when she rides in the car. Enjoying the outdoors, Sunflower loves to go on walks and is walking well on leash with her foster family, not even pulling on the leash. The only command she knows is “stay,” so obedience classes must be in Sunflower’s future to help her learn to be a responsive, safe family member. Training will also help in her bonding with her forever family. MAESSR only places puppies (even one year old ones) in homes that are committed to training and bonding with the pup in obedience classes. Puppies require a lot of care, attention, and patience! The decision to get a puppy and raise it to be a healthy, happy, and well-adjusted dog is a serious commitment. To reinforce this commitment, MAESSR requires all adopters of dogs a year old and younger to enroll their puppy in obedience classes within 60 days of adoption. Sunflower will be a star pupil. Sunflower takes to bathing very well and allows her people to use a hair dryer to dry her off. Spanish Water Dogs are usually groomed twice a year and do not need brushing. Due to matting issues when she arrived in foster care, her vet shaved her down but her coat is beginning to grow out. Her fur is really soft and she loves being stroked. A good girl at the vet, she is up to date on all her shots and the vet said she was very healthy although a bit under weight. Trying to put some weight on Sunflower won’t be a hard task since she loves her food and treats, eating all her food when it is given to her. 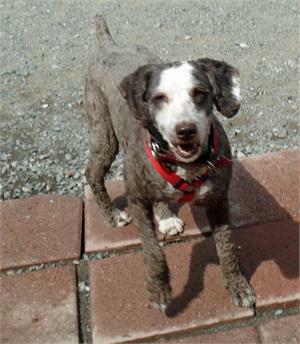 An ideal home for Sunflower would be one where her trust in people could be built slowly. She probably would flourish with a non-aggressive doggie companion with a positive attitude to give her a canine example to follow. Watch for more updates to follow on this little ray of sunshine.